• You live in an uncertain world on the edge of change. Transform it. • You have access to the greatest power in the universe through Jesus Christ. Use it. • You possess a life saturated with passion and potential. Surrender it. Have you ever looked in the mirror and realized that the person staring back is nothing like the person who began the journey? I had to completely relinquish my identity as an individual, let go of my strengths, and trust in God before I could truly embrace my identity in Christ. Having God as your identity means that you place your worth in your relationship with Him. Identifying in Christ means that absolutely everything in your life can fall away and you will still have hope. You find your identity in Christ by spending time with Him, looking for Him in your everyday life, and seeing yourself from His perspective to the best of your ability. The Almighty wants to be your identity, and He promises to never leave you. The only way to truly make a difference in the world is to stand beyond the world and surrender your life to God. So choose Him. Every. Single. Day. 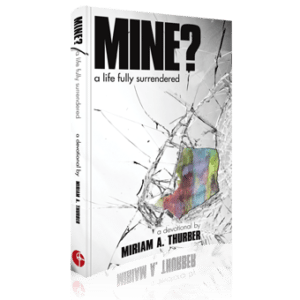 Miriam Thurber grew up as a pastor’s kid, and thus developed a love for the Bible and theology at a young age. Her fascination with writing and public speaking allowed her to grow her sphere of influence to encompass a column in a newspaper and various leadership positions within Bible studies and youth organizations while still in high school. My passionate spirit drives everything that I do, and my energy makes every moment exciting. I believe that no challenge is too great because every time I’ve stepped out in faith, God has abundantly provided strength, peace and opportunity. My soul is fulfilled through complete dependence on God, so I eagerly accept unique opportunities to grow. Such adventures have included distributing eyeglasses to orphans in Cameroon, caring for elephants in Thailand and teaching a drama/speech class in a Central Asian school. Currently, I write, speak, major in public relations at Messiah College and work with various organizations to increase their communication endeavors. I wholeheartedly believe that our generation can change the world, so I dedicate my ministry to igniting the fire of Jesus within my peers through writing, speaking and personal interaction.